2 bedrooms, 1 bathroom, sleeps four to six. Large Lounge/Diner which is equipped with dining table, six chairs, two sofas (one a sofa bed), TV(22 English Channels), DVD/CD/MP3 player, Communal WiFi. Modern kitchen is equipped with a dishwasher, fridge freezer, oven, ceramic hob, microwave, kettle, toaster, iron and washing machine and has its own door leading to the sun terrace. Master bedroom with double bed, built-in wardrobes and air conditioning. Second bedroom with two single beds, built-in wardrobes and air conditioning. Bathroom with WC, bidet, bath and shower. Large south facing sun terrace (with cane dining table and chairs) which overlooks the beautiful private gardens and large communal swimming pool with children’s paddling area. Sun loungers and deck chairs also provided. Mundomar marine park, Vergel Safari park and the new Terra Mitica theme park are within half an hour's drive. The coastline in this part of Spain is studded with charming coves and bays. Jávea Golf Club is less than 10 minutes away and towards Denia (c.15 minutes) is La Sella Golf Club, a beautiful 18-hole course. You can fly to either Alicante or Valencia for the nearest Airports and Javea as around an hours drive from each airport. The apartment is on the second floor, there are a few steps to the lift. Just got back from week stay at Bolonia apartments. Apartment was first class, clean, tidy and with everything you could possibly want. John the owner made sure a welcome pack of tea, coffee etc was made available, "very useful when landing at airport late at night". 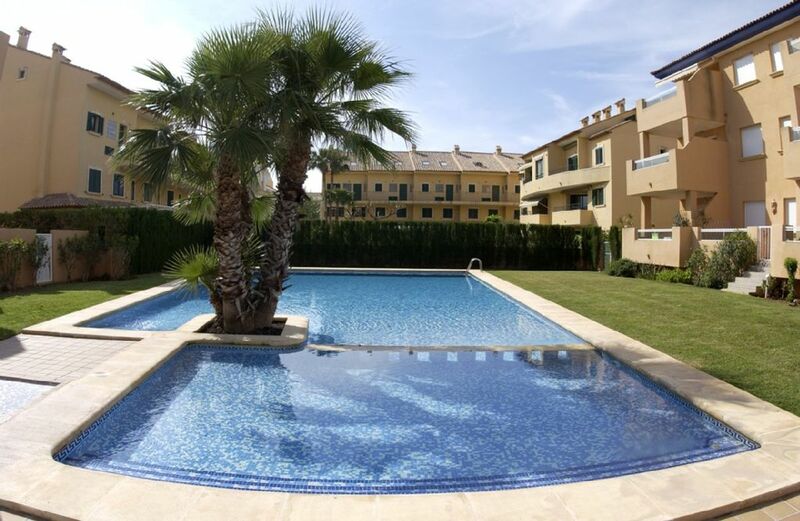 The apartment is within easy walking distance of Javea port which has a good selection of bars and restaurants, lovely place to sit with a coffee and watch the world go by. I would not hesitate to recommend this apartment to both couples and families with children. Many thanks John for a nice relaxing week at your apartment. The apartment is situated a short walk from the pebble beach (1 minute) and the Port area (5 minutes) with its promenade of shops and restaurants overlooking the beautiful bay which leads to the Marina. The Playa Arenal (5 mins by Car or 15 mins walk) has a large sandy beach. The apartment is reached via security gates into the main grounds and via a secure entrance lobby which leads to the 2nd floor serviced by both a lift and stairs.